Key Bits: N/A, because they’re all equally great. 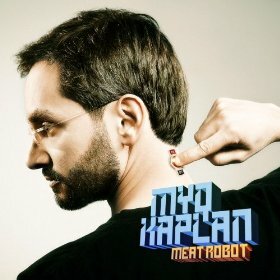 “You seem like a good crowd, like my demographic, which is people that know the word demographic” quips Kaplan on the opening bit of his album, “Meat Robot.” The comedian, still on the rise, is known for rapid-fire jokes that often involve clever wordplay and math. Kaplan is a vegan, and has used that as the basis on many bits from his two albums, this and his equally excellent debut, “Vegan Mind Meld.” The third track on “Meat Robot” sees him coming up with names of fake meats that have yet to be invented, including fake chicken called “Fiction,” “Chicken Pretenders,” “Baby Back Fibs” and “Ven-Isn’t.” This is just a taste (pun somewhat intended) of the wordplay Kaplan delves into. Kaplan comes off as being as nerdy as he looks, and he has always used this as an advantage in his comedy. “Apollo is Apollo in Greek, in Roman, in French, in everything except Spanish, where he is a chicken.” Yet he still makes bathroom humor and race jokes, in totally inverted and original ways that appeal to broad audiences. The only fault in “Vegan Mind Meld” is that Kaplan’s rapid-fire delivery went too fast at points, and although it makes it funnier, it requires a few listens to pick up every joke. He is still very speedy on this album, but he slows down a bit. At points, he audibly stops himself to slow down. Every bit on this album sticks. Some require a little work and patience, others are instant one-liners. But Kaplan’s grasp at smart and original stand-up is wholly original. The only fault on this album is not one of Kaplan’s, but the constant shrill of one audience member who almost ruins jokes. “Meat Robot” is a work of comic brilliance, one that tests the audience, but pays off on every single joke. If you like this, try: “I Have a Pony” by Steven Wright. A classic comedy album from an even more deranged mind.